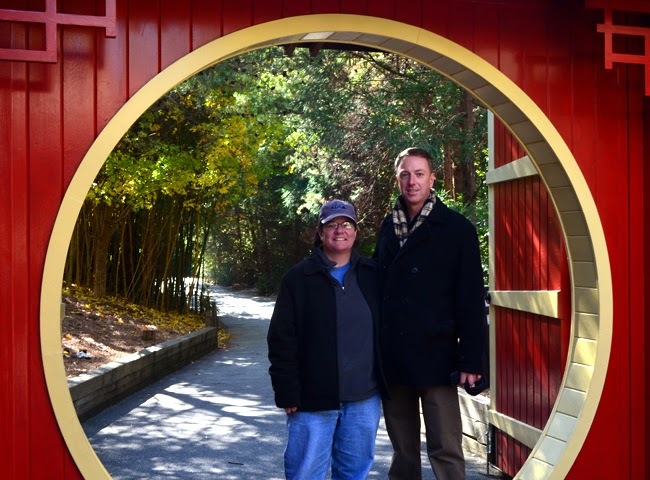 wanderlust ATLANTA: Zoo in the winter? Of course! 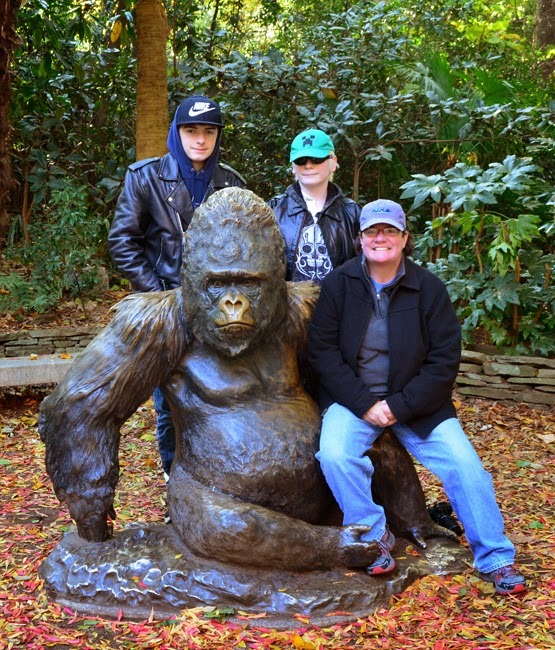 I went with Mary Jo and the guys to Zoo Atlanta last weekend. This was our return visit after a "mini visit" in May of this year. It was cold, but it warmed up to be a beautiful day and although all the animals weren't out—which is never a guarantee, of course—the ones we saw were great fun! And we had the opportunity to speak with more zoo staff than we usually would have. The statue of the world-famous Willie B. is a fantastic photo-op for family photos, as in the one above of Mary Jo and the guys. We've taken advantage of this opportunity more than once. We were at Zoo Atlanta courtesy of Where Atlanta. Earlier this year I entered a photo contest and won tickets to see The Lion King at The Fox Theatre. I thought that was the extent of my prize, but when the tickets arrived, there were also four tickets to Zoo Atlanta and a gift card to Hard Rock Cafe, which we enjoyed after our visit to the zoo on this particular visit. The guys had never been to Hard Rock, which made it even more fun. "Thank you," Where Atlanta! I also want to give an extra shout-out to Zoo Atlanta for making this trip extra special. When we visited in May, we arrived in the afternoon, shortly before the zoo was closing early for a special event. One of the zoo staff heard the disappointment in the guys' voices (they weren't complaining, just a little deflated that we wouldn't be able to get in a full visit, if we stayed at all). She kindly invited us in with the tickets we had to enjoy as much of the zoo as we could fit in and then gave us tickets to return later...that's what this visit was. "Thank you!" Zoo Atlanta! They guys very much enjoy the World of Reptiles, so that was a highlight of the visit. I had the pleasure of sharing with them the news of Scaly Slimy Spectacular: The Amphibian and Reptile Experience, a new structure and animal home at Zoo Atlanta scheduled to open in late 2015. We saw the top of the under-construction building off in the distance when at the African Savanna habitat. 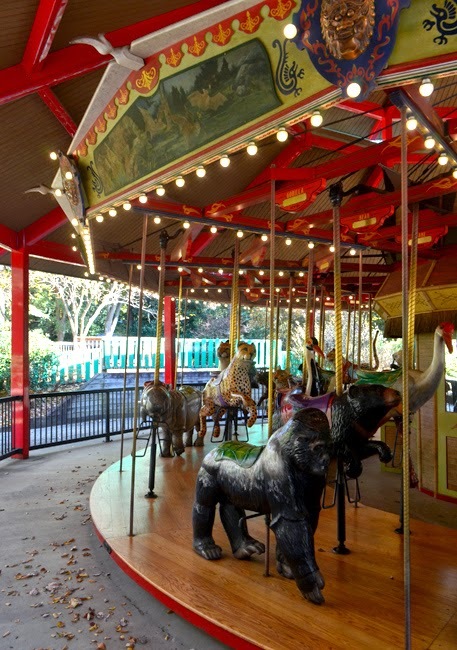 With the neighboring Cyclorama painting moving to the Atlanta History Center and Zoo Atlanta taking over and transforming the Cyclorama Building into a special events facility, as well as renovating the Savanna Exhibit, there's a LOT going on at Zoo Atlanta! Kam was a super-fun this trip! Sometimes camera-shy, he was a ham for the camera on this particular visit, which is always fun. I was quite impressed with the guys' knowledge of amphibians. 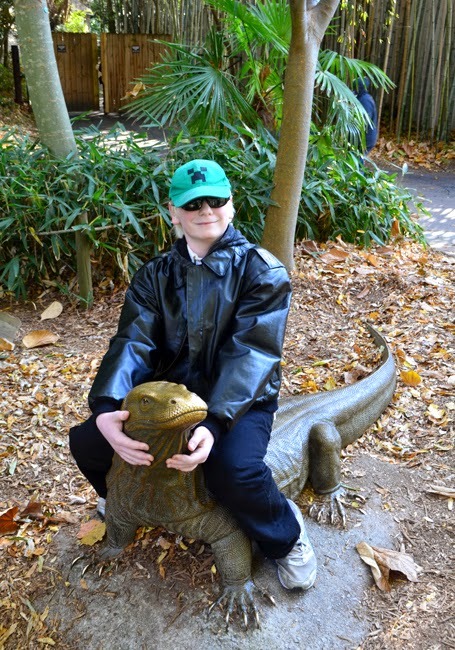 I thought a trip to the zoo would be an educational experience for the guys, and it was, but it was also a wonderful educational experience for me. These guys are smart! With some of the animals not on view—nestled warmly in their indoor quarters—you pay more attention to the magnificent art throughout of zoo. 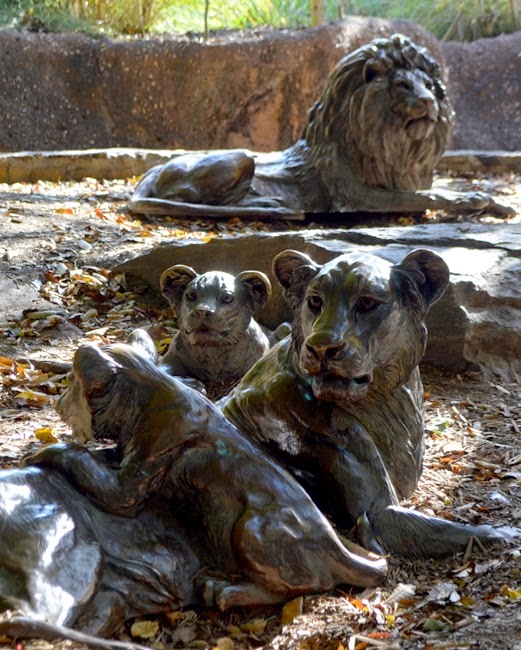 You realize there's quite a lot of art at the zoo when you take the time to look around, and there's more than statuary, so keep your eyes peeled. We knew it was going to be a cold day, but not as cold as the Saturday two weeks before when we were going to be there (the winds were torrential that day!). But there are plenty of habitats that are indoors—and heated—to break up being in the elements. One of the more cool indoor diversions was a discussion with a Zoo Atlanta keeper who showed and told us all about the Blue-Tongue Skink. They're awesome! And we got to see its blue tongue. It really is blue...and not just because it was cold. Its blue tongue is a defense mechanism. Think about it. Not many things in nature are blue. 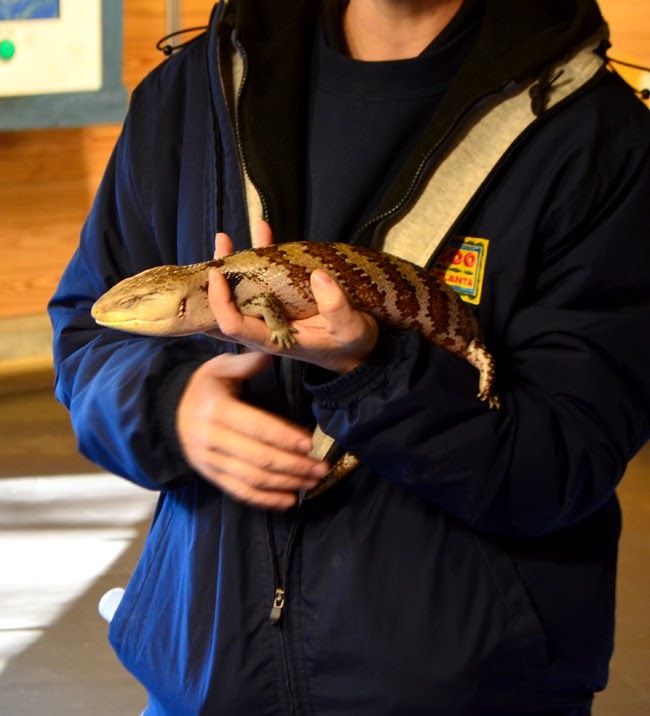 When threatened, the Blue-Tongue Skink will flash its blue tongue, which startles a number of predators. We learned a lot from the keeper, who was highly knowledgeable and super nice. 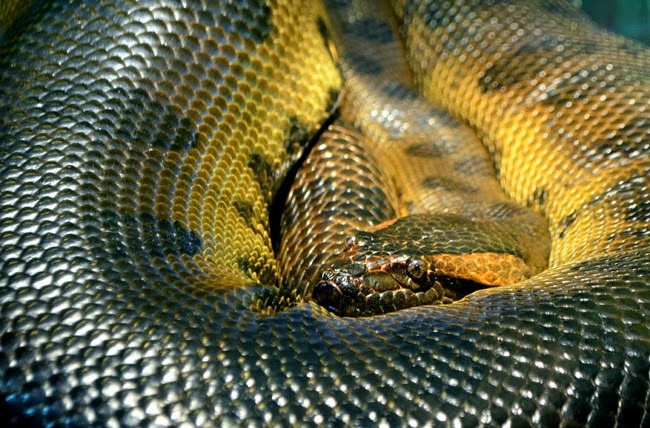 Many visitors don't realize the size of Zoo Atlanta's reptile collection. There are more than 450 at the zoo, but many are not on exhibit because of space limitations. The new reptile and amphibian complex will be home to many of those, as well as large crocodilians and other new arrivals. 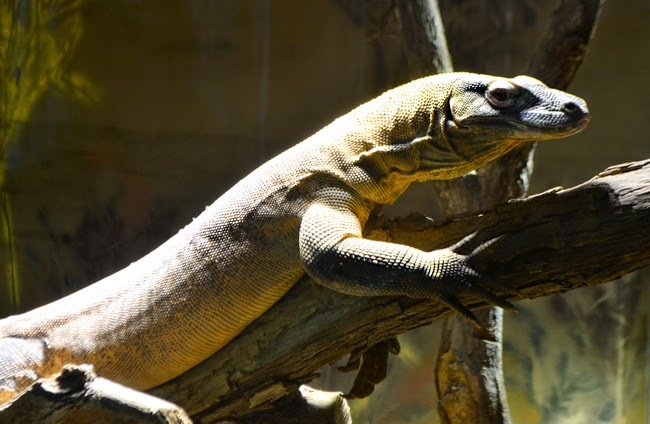 The complex will also feature "interactive indoor venues and state-of-the-art exhibits showcasing the amazing extremes in size, speed, color and behavior that make reptiles and amphibians such compelling animals to observe, study, and protect." As one who dabbles in Graphic Design—and my minor in college—I love when museums and attractions make the most of details. 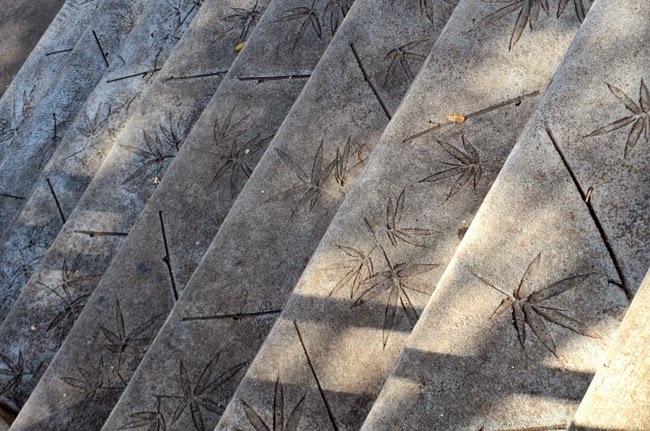 All throughout the Zoo the sidewalks are stamped with leaves. The sidewalks near the panda habitat, pictured above, are stamped with bamboo. Mary Jo is one of my dearest and longest friends. We've been through a lot together and we're those kinds of friends who can go a long time without seeing each other—like the years I lived in Washington, DC—and pick right up where we left off. Zach made this photo of us (above). He's a promising photographer, don't you think? 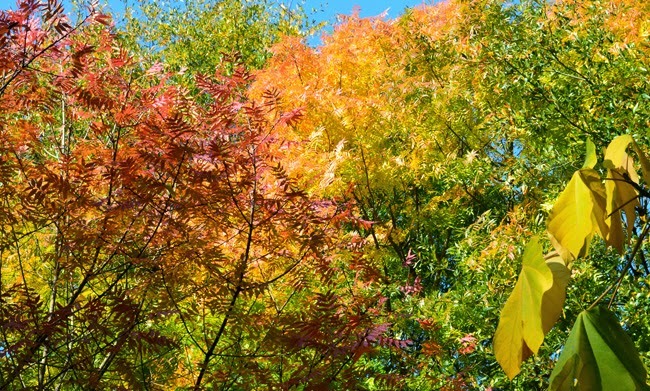 It was the middle of November when we went, which can be cold in Atlanta, but it's undoubtedly a beautiful time of year. The above photo was made just outside the gorilla habitat. The gorillas and orangutans weren't on view...not until later, after the temperatures surpass 40 degrees, at least (I believe that's what I remember them saying about the orangutans). Good to know that they're cognizant of the animals' sensitivities to temperatures. The bears and pandas were, of course, out in their habitats. The pandas were delightfully playful, but the bear (the one we saw) was lazing around sunning himself atop one of his climbing structures. I didn't blame him on bit! I'm a kid again when it comes to things like carousels. I've not rode one in many years, but I've long admired their beauty and how much fun they bring to those who do ride. Zoo Atlanta's carousel, The Nabisco Endangered Species Carousel, features 38 hand-carved, festive animal mounts and seats, I believe unique among carousels. If you're a fan of carousels, specifically carousel horses, I invite you to check out "Flying Horses: The Golden Age of American Carousel Art", written by Peter J. Malia, a colleague from my years on Washington, DC. It's a gorgeous hardcover book and a must-have for any carousel horse enthusiast. I'd like to offer another "Thank you!" to Where Atlanta for the tickets and gift card—the contest and experiences were great fun! And a "Thank you!" to Zoo Atlanta for making our visits such great fun, as well. I'll be back again and again!